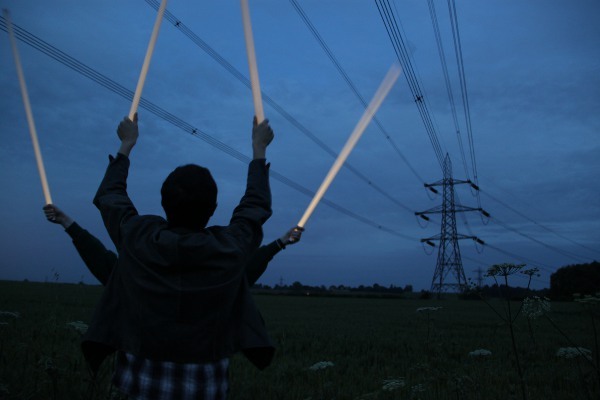 If you take a normal long fluorescent tube and hold it vertically under a high voltage power line after dark you will be able to see that it lights up of its own accord. 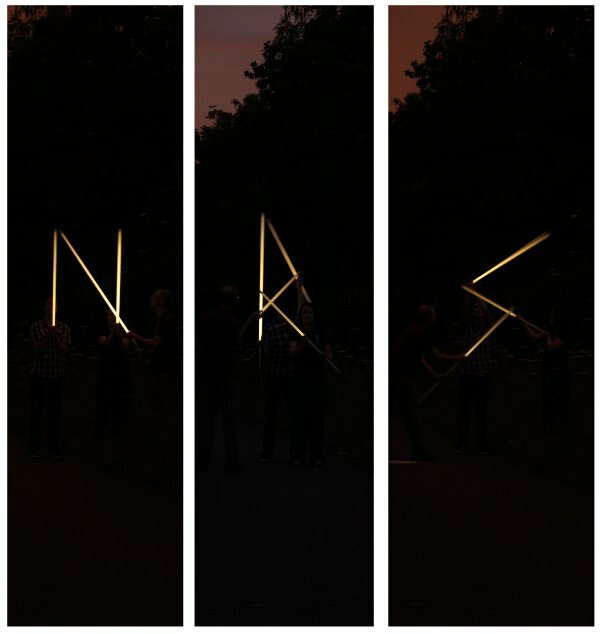 Three of us had a go at this a few nights ago near an Oxford substation. Tubes being held under pylons at dusk. There is no external power source involved. The effect is because the power lines induce an alternating magnetic field around themselves as they conduct electricity. The higher the current being carried by the cables, the greater the effect as magnetic field density is proportional to current. In this case, the cables were carrying current for half of Oxford, so quite a lot. The alternating magnetic field induces a voltage across conductors (in this case the tube) and a current is set up which is enough to light the tubes. These tubes aren't glowing as brightly as if you'd plugged them in but they're certainly visible to the naked eye. Much like a glow stick that's been snapped for a few hours already. With enough patience and cramped muscles (some of these exposures are 15 seconds long), it is even possible to form letters like those below. Some letters (like 'E' or 'T' are very difficult or impossible to achieve because the effect is limited to when the tubes are perpendicular to the wire. As you lower the tube to the parallel position, they flicker and go out. Even the letters we did were tricky as the tubes have to be a certain distance apart. Each of the people in these photos are stood about a metre apart holding the tubes so that they look good from the camera's point of view. The camera was maybe 20 to 30 metres away on a tripod. If you want to do this yourself, a good place to start is with a high quality local map. In the UK, the OS Landranger pink 1:50,000 maps are great. Try and trace pylons across the maps, preferably from power stations to large urban areas. Then see where the power lines are crossed by public rights of way like footpaths, bridleways and so on. You'll want to find a spot that's dark so well away from streetlights etc. Then take some tubes just after sunset and have fun! 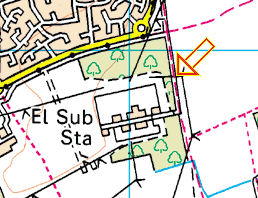 In our case, we went to stand on the public bridleway just to the east of this substation. It's also the access road for the substation so it's tarmacked which was nice. Substation map. Grid reference: OS SP562018. Published on 30th June 2012.